The song has already made a good hype in the promos. Irshad Kamil has penned very beautiful lyrics (He is consistently brilliant. Refer my previous post, Mere Brother Ki Dulhan). The singer Shahid Mallaya sounds like Roop Kumar Rathod; but has done a commendable job. Indian instruments like flute (so beautiful and melodious) sound very romantic. This one creates good tux for the album! The other version by Rahat Fateh Ali Khan is an interesting mix too. The song is a mediocre attempt, I must say. The lyrics are bang on, and create a good tempo “Sajh Dhaj Ke, Tashan Main Rehna”. Mika is good. The problem lies in the genre of the song. The song starts as a folk song, turns into bhangra track with some electronic beats and Hinglish lyrics in between. Amidst this fusion, the song looses the soul unlike Mauja Mauja and other Bhangra tracks from Prittam and Mika. Wow! This one is something good. Thanks Prittam. You shine in this song. The tune itself is mesmerizing. Moreover, lyrics add sparks to the song. I am in love with this song. This song completely impulses me; makes me feel nostalgic; so nostalgic. There are three versions of this song, One by Hans Raj Hans, other one by Shahid Mallaya and the Mehfil Mix by Wadali Brothers. The best one is the reprise version. This is something unexpected from Prittam. A semi classical song from Prittam. Lyrics are noteworthy. Ustad Rashid Khan is outstanding. His singing creates new levels for the song. 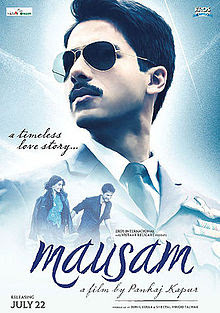 The song expresses intense emotional desires and this is what Mausam is all about, Intense Romance. This will surely be a hard-core romantic flick. This one is again a descent attempt. We have heard this kind of song in the climax of almost every Yashraj Movies and Dharma Movies. The tune is inspired from Gujarati Folk songs. The very famous folk singer ( Dholi Taro Dhol Baaje and Kesariya Balam) does a good job. Now, this is good. Prittam is sure about the genre this time, unlike Sajh Dhaj Ke, the song is electronic Bhangra track. In addition, this one reminds me of Aahun Aahun, Love Aaj Kal. There are two versions of this song, one by Tochi Raina and other by Lember Hussainpuri (Sadi Galli fame). Both the versions sound equally good and it is difficult to pin point the better one. Four tunes out of six are outstanding, one is average and one is avoidable. Overall, this album reminds me of the romantic tunes of early 2000’s. Welcome back, Prittam!